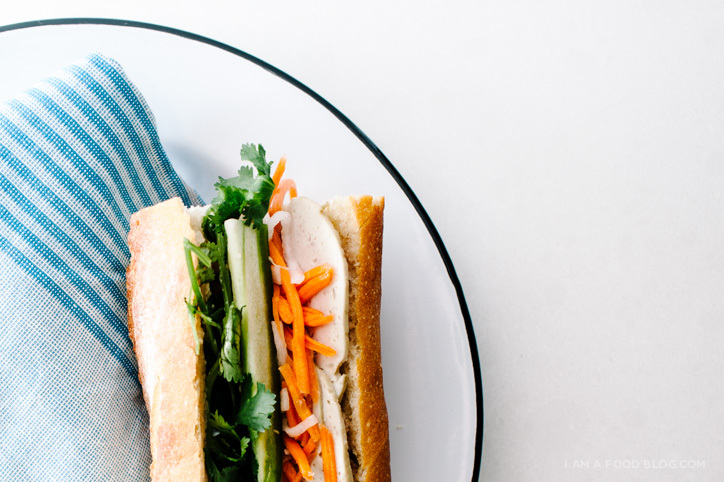 I think bánh mì, or Vietnamese sandwiches might be my favourite sandwich. Typically, they’re made on light, crackly baguettes with fluffy, cloud-like insides – the perfect canvas for rich, savoury meats, sweet and sour pickled carrots and daikon, fresh cilantro and spicy jalapeños. The combination of flavours and textures is something that most people fall in love with, once they’re tried them. Of course, you can easily stop by a Vietnamese deli and pick up a couple of sandwiches for a song, but sometimes, you just want to assemble everything at home. This is especially good for people who like making up their own combinations. If you want to go light on the cilantro or heavy on the pâté, assembling your own sandwiches at home is the way to go. If you’re lucky, you live near a Vietnamese deli that’ll sell you everything you need: Vietnamese baguettes, pâté, ham, headcheese and even Vietnamese mayonnaise. Lots of Vietnamese families will do just this and make their own sandwiches at home (or so I’m told by my husband). If you don’t live remotely near any Asian stores, you can make a pretty tasty approximation of this addictive sandwich from ingredients you should be able to find at your local grocery store. The daikon and carrot pickles are the one thing you shouldn’t skip out on. Daikon can be found at most grocery stores (at least here on the West Coast). When I was buying mine, my cashier had to ask one of her co-workers what it was, but he knew instantly. Cashier 1: Hey, dude, what is this?! Cashier 2: It’s daikon. 4598. Cashier 1: Daikon, huh? That’s an awesome name. It looks like daikon. Daikon the DESTROYER! Cashier 2: I’m totally calling myself Daikon the Destroyer from now on! I kind of want to start a webcomic about Daikon the Destroyer now. He’d go around destroying all sandwiches because they’d be his mortal enemies. Destroyers aside, find yourself some daikon and make these! They’re perfect on picnics or as midnight snacks. And remember, there are no hard and fast rules – the beauty of sandwiches is that they are filled with whatever it is that you love. 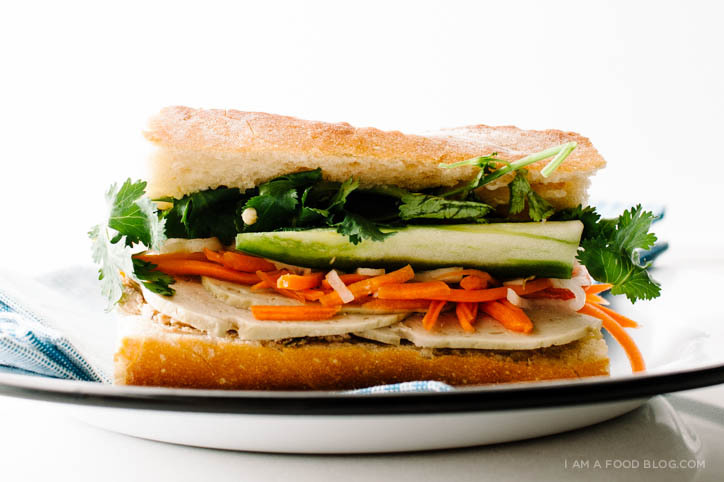 i am tasty, i am portable: i am banh mi! Slice the baguette lengthwise, but not all the way through. Lightly toast and spread a thin layer of pâté on the bottom and a thin layer of mayo on the top. Layer on slices of headcheese, then ham. Top with pickled daikon and carrot, cilantro and sliced jalapeños, if using. Enjoy! Note: You can easily buy Vietnamese head cheese and ham at your local Asian grocery store, but if you don’t happen to have one close by, most delis will have headcheese and uncured ham, both which work wonderfully. 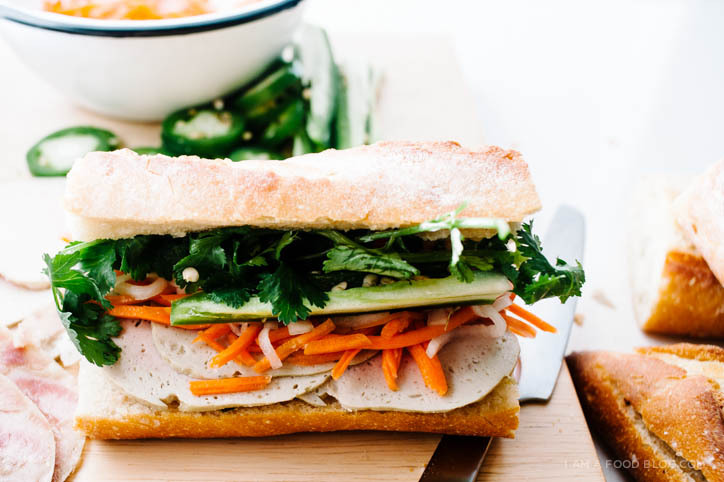 A lot of the banh mi flavors come from the pâté and pickled carrots and daikon, so don’t skip out on those! 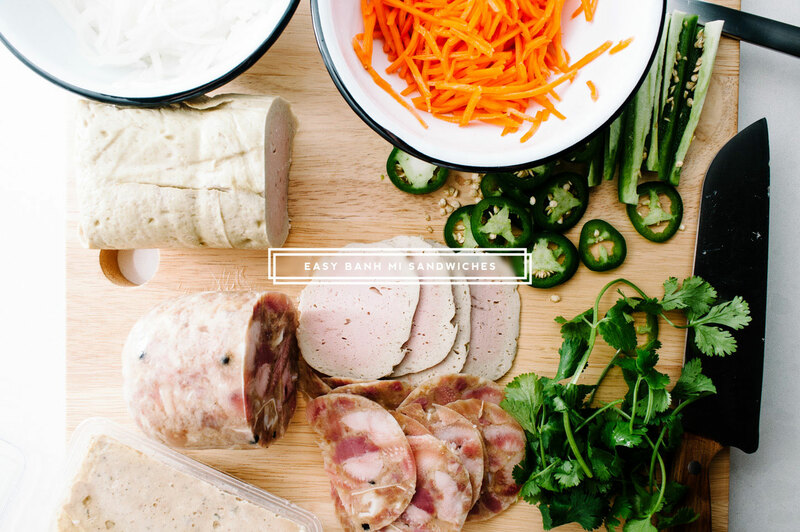 PS – Molly made some awesome bánh mì hot dogs! Check them out! Daikon the destroyer – love it! These sandwiches look amazing… I’m curious though… I am one of those people who can’t stand cilantro – is there a logical substitution? (beyond the obvious, simply skip it :) Thanks! hmm, i’d just skip out on the cilantro. you could try some thai basil or green onions! I think that I’m going to find a way to make Daikon the Destroyer a part of our future children’s lives. It needs to happen. hahaha that cashier was awesome! omg daikon the destroyer lol lol i’m laughing so hard over here! Did now know there were different Vietnamese mayos though! Will have to seek them out when I go to an Asian market. Just looked it up and Kewpie mayo is made with rice vinegar? Sounds interesting / like it would be a tiny bit sweeter than regular mayo? yes, daikons are HUGE! pickles in the fridge are a must! they make the mayo fresh – usually at vietnamese delis. it’s more yellow and thick. i’m pretty sure there are more eggs in it. Haha that checker knew the daikon SKU by heart! Rock on. I have not seen any Kewpie mayo at my usual Asian market haunt! They definitely have headcheese, though. It’s run by a Vietnamese family, and they sell the PERFECT rolls, too! Beautiful photos, lady! Oh god I love banh mi sandwiches! Yum! Can’t wait to try my own. Haha Daikon the Destroyer would be such a cool comic! I LOVE banh mi. I discovered it only a few months ago because I thought it was a glorified sub. But wow, that crispy bread is something to die for. You don’t know love till you bite into one. The people on the other side were looking at me after I crackled bit hee. I had mine with curry chicken and that chicken tasted like some satay mix. Oh delicious. Now I’m drooling. the BREAD. i live for that bread. I LOVE THIS. 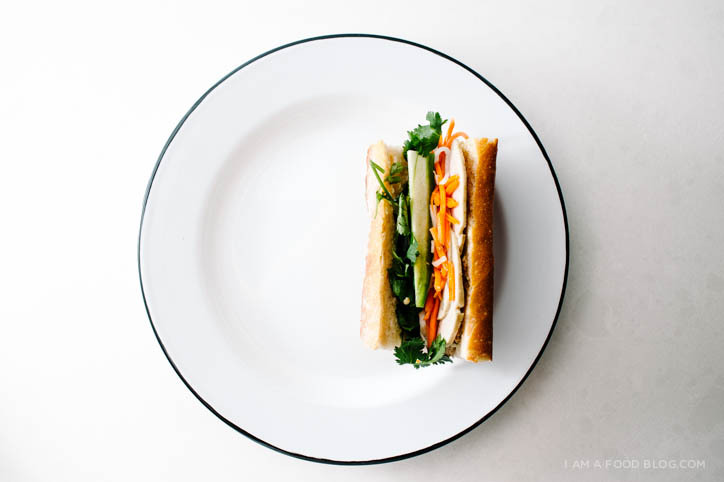 And now I’m craving banh mi…. Also, daikon the destroyer!!! Please please please write that webcomic. I’m pretty sure it would make my life. Kind of like this guy does. hahahha i’ll get on it! do you want to be daikon the destroyer and i’ll be cilantro the silly? I have never heard of this kind of sandwich, but it sure is right up my alley. I love the juxtaposition of flavors—–a lot. I did go to a class about pickling the veggies. Yay! So things are coming together to use that knowledge. 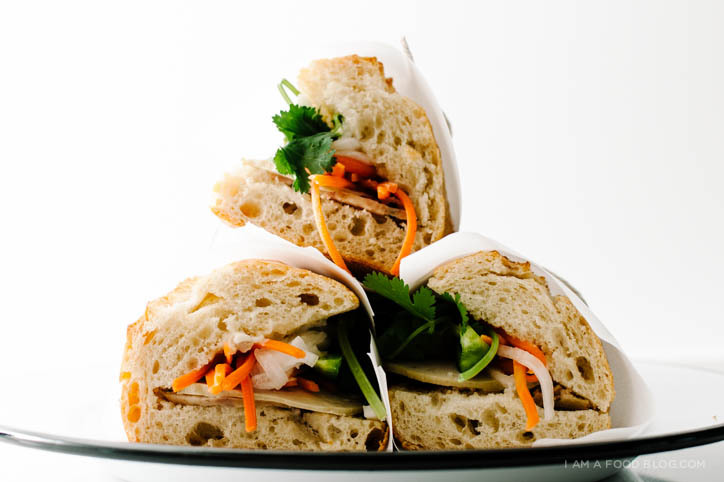 ooh, you need to try a vietnamese sandwich as soon as possible! they’re so delicious! 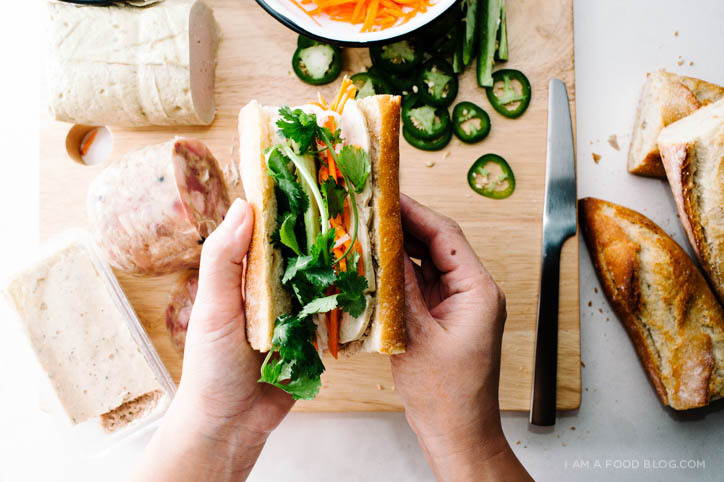 My mom used to buy fresh bags of baguettes and we’d make banh mi at home growing up. 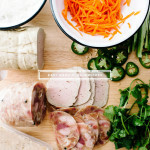 We would put in our banh mi: cooked Spam, mayo, Maggi sauce, cilantro, pickled carrots/daikon, cucumbers, and jalapenos. How does the carrot & daikon get pickled without any vinegar?